These photographs come from the collection of Tony Hoskins. The photographer(s) is unknown. If anyone can add any information about their identity or can supply information as to the date taken (probably late 1963 or the first half of 1964) or identify the railwaymen please let us know. Even had it been without numberplates this locomotive is the instantly recognisable spark arrestor chimney fitted Worcester based 0-6-0 Pannier Tank locomotive No.1661. 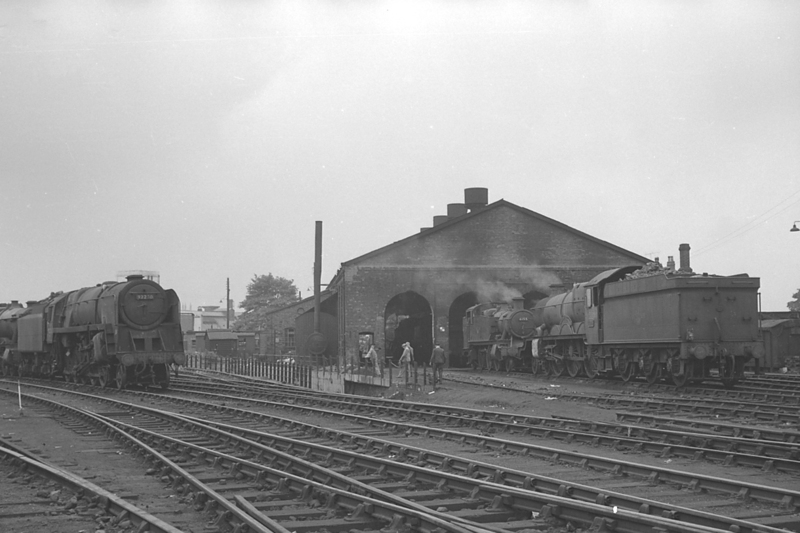 On the left of the photograph is 'County' class 4-6-0 steam locomotive No.1011 ' County of Chester' which was the last of its class to be withdrawn in November 1964. 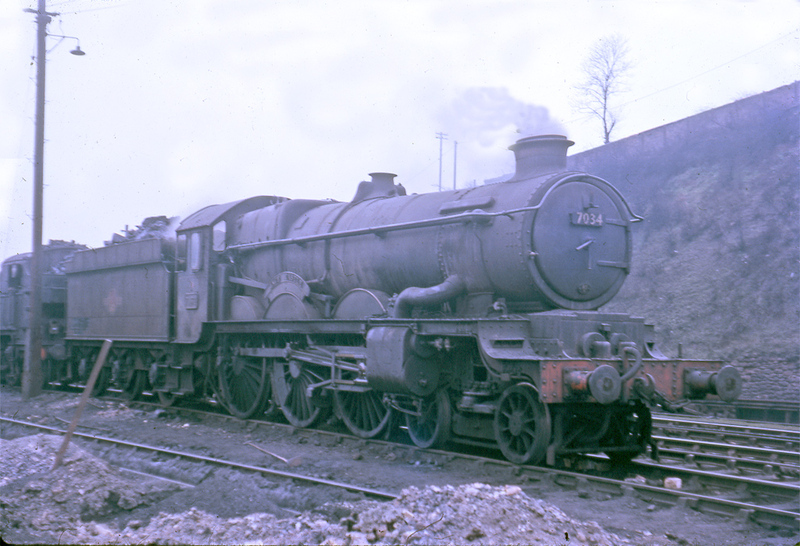 No.1661 was withdrawn in June 1964. The running shed is behind. BR Swindon built 'Castle' class 4-6-0 No.7025 'Sudeley Castle' was probably the last active Worcester based member of its class being withdrawn after the end of the 1964 summer timetable. It saw little use that summer but was often in steam should it be needed to cover for a failed diesel. 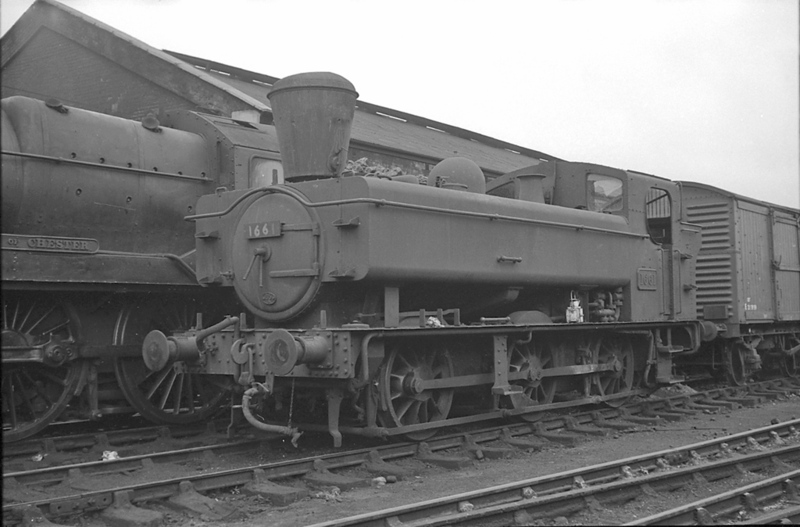 It is standing in the shed yard at Worcester. 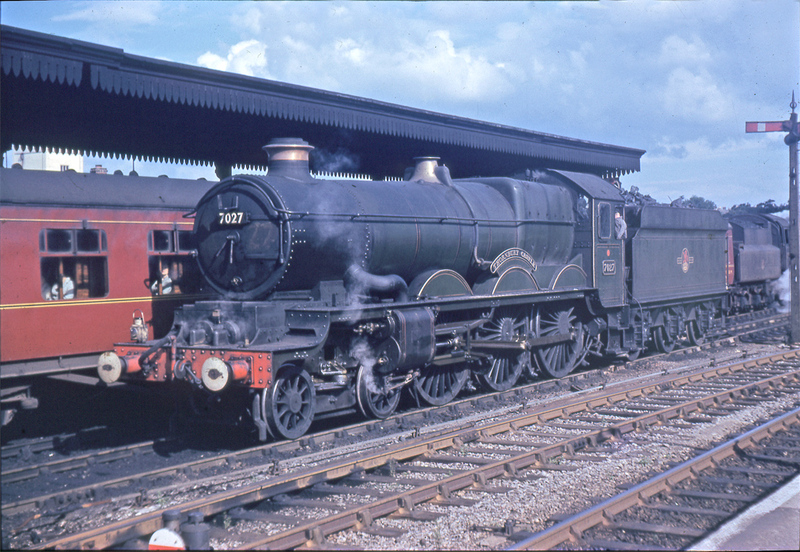 This is BR 'Standard' class 9F 2-10-0 steam locomotive No.92230 which although based at Gloucester had the dubious honour of being withdrawn at Worcester shed on 31st December 1965, at the very end of steam operations at Worcester and Gloucester. Quite why is was withdrawn at Worcester and not at its home shed is not known but perhaps indicates that it had failed in service. A 'County' class 4-6-0, probably No.1011 ' County of Chester' is behind the 9F with a 2-6-2 tank engine locomotive on the right of the three workers learning on the fence. A good clue as to the date of this and the other three photographs is that the line alongside the locomotive shed which ran down to sidings alongside Tolladine Road is closed and lifted. This photograph is very interesting as it provides a clear view of Worcester's stationary boiler which was housed in its own shed alongside the four road 'washout' shed. No.92230 and the 'County' are on the left as in the photograph above. The 2-6-2 tank locomotive can be identified as '61xx' class No.6155 with an unidentified single chimney 'Castle' class 4-6-0 alongside. 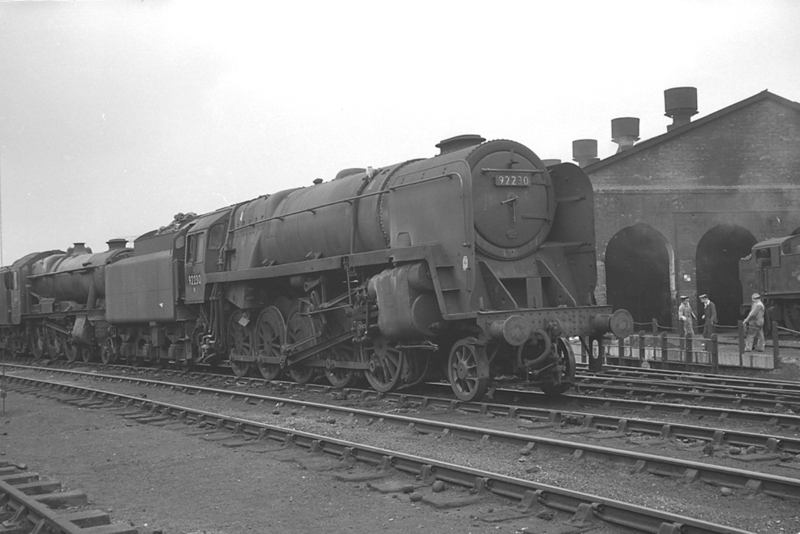 Although the number of the 'Castle' has not been ascertained its filthy condition indicates that is not No.7025 'Sudeley Castle' and might perhaps be a Gloucester based example. The same railwaymen are leaning on the fence as another, possibly office based, worker makes his way to the shed. This photograph instantly reminded some members of the MIAC of the last days of steam at Worcester when BR built 'Castle' class 4-6-0 No.7023 'Penrice Castle' was stored serviceable at Worcester between September and December 1963. This locomotive had been selected to work the last steam hauled express passenger train from Worcester to London on Saturday 7th September 1963. After this date all services were supposed to be worked by diesel traction but such was the shortage of available diesel traction that shortly before Christmas 1963 'Penrice' was put back into traffic and remained in service at Worcester until June 1964 when along with No.7011 'Banbury Castle' it was transferred to Oxley shed from where is was withdrawn in February 1965. This photograph was taken on 15th September 1963. In this stunning photograph of BR built 'Castle' class 4-6-0 No.7027 'Thornbury Castle' of Worcester shed in immaculate condition is in one of the two centre roads at Worcester Shrub Hill. The locomotive was probably waiting for the road to the locomotive sheds having brought in the Hereford to Worcester portion of a London Paddington bound express probably in the Summer of 1963. The identity of the man on the footplate has not yet been established. 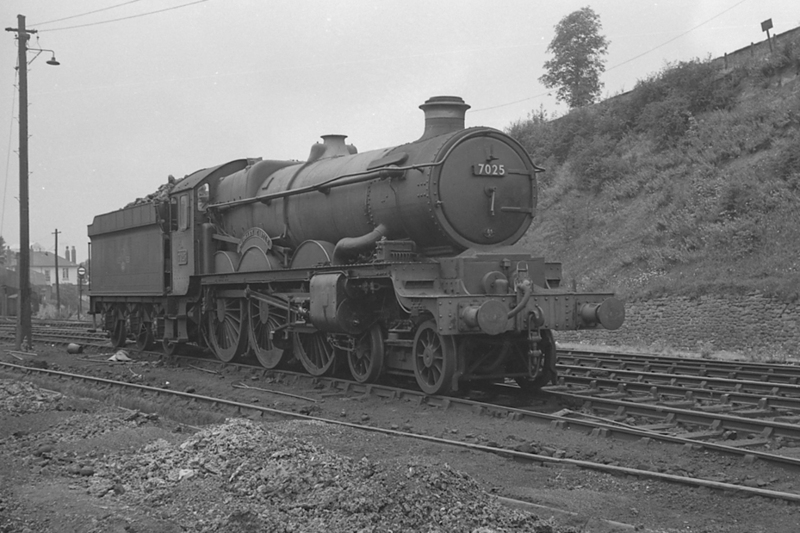 No.7034 'Ince Castle' was never allocated to Worcester and at the time of this photograph in 1964 was based at Gloucester. 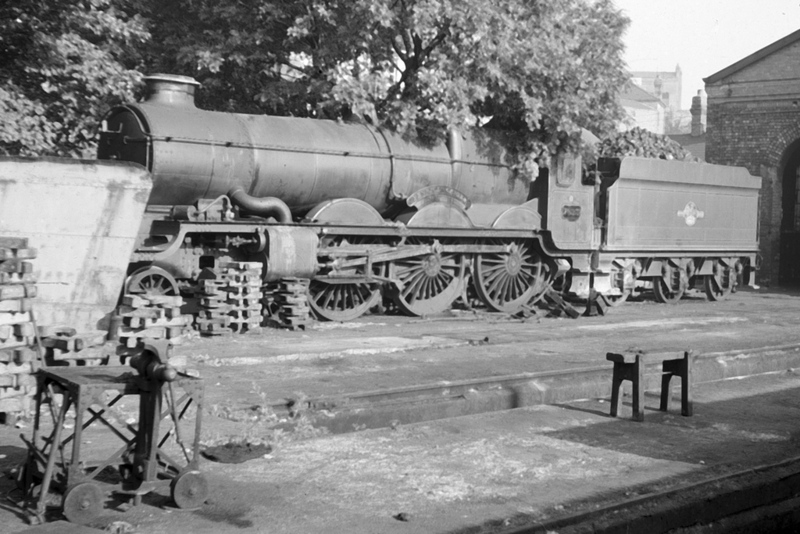 It would seem the locomotive had not been cleaned for a long time and it almost remained in this state until withdrawn in 1965. I've just been perusing Gerald Wadley notes and then Mick Rock. I haven't seen Gerald since I left the Grammar School in Worcester but the last I saw Mick was just after he left Worcester to go teaching at Weymouth, I guess this was around the time I joined the RAF in 1967 or perhaps a few years later, I can't really remember. Nice to know he's still around. I have fond memories of Rocky, Ringer Reynolds and myself, then known as Flogger Hoskins, playing 'hand tennis' on the Bredicot road at Spetchley on summer evenings in the early 1960s. In between trains, we used to knock a tennis ball around each other with open bare hands and I remember Rocky's hands sometimes bleeding due to the battering they took as a fireman. We would often stay beyond dusk and use a powerful torch to get the loco numbers, it wasn't always successful, much depended on the speed of the trains!. I've lost my notes from those days at Bredicot and Spetchley just retaining some from a few trips I made with the Worcester Locomotive Society to South Wales and some odds and ends from private trips of mine to places such as Swindon, Wolverhampton and Tamworth (plus an interesting trip from Worcester to Newark and back, by Midland Red - in a day!). have two particular memories of Spetchley that have never left me. Occasionally, on a summer Saturday, we would congregate at the footbridge just south of the old Spetchley Yard. It was a great vantage point and we would never be bothered by passing cars and lorries (not that there were many in those days) One Saturday, possibly 1961 or 1962, there was great excitement when Jubilee No.45680 'Camperdown', roared south on a summer special. This was a rare sighting indeed because I'm pretty sure it was then a Carlisle loco. The second which became a real teaser, was when I cycled to Bredicot one Saturday morning and arrived before anyone else. I put my bike against the fence on the Crowle side of the line just as the roar of a northbound train, approaching at great speed, fell upon my ears. I waited for the train to appear beneath the bridge and it was a Royal Scot. Although it escapes me, I did get the number and I think it was 46148 The Manchester Regiment, but to my utter amazement, there was another Scot right behind it double heading. I was so taken aback that I missed it completely!! Of course when everyone else arrived, they just wouldn't believe me. I'm sure someone somewhere would have seen this but to this day, I doubt if anyone would still believe me! I never saw a double headed Scot after and I haven't even seen a photograph of one anywhere.